Ever wondered what it was like to write the Harry Potter books? Well, if you have $100,000 sitting around you can find out. The chair that JK Rowling sat in while writing the first two installments of the legendary series (Harry Potter and the Sorcerer’s Stone and Harry Potter and the Chamber of Secret) will go up for auction on April 6. 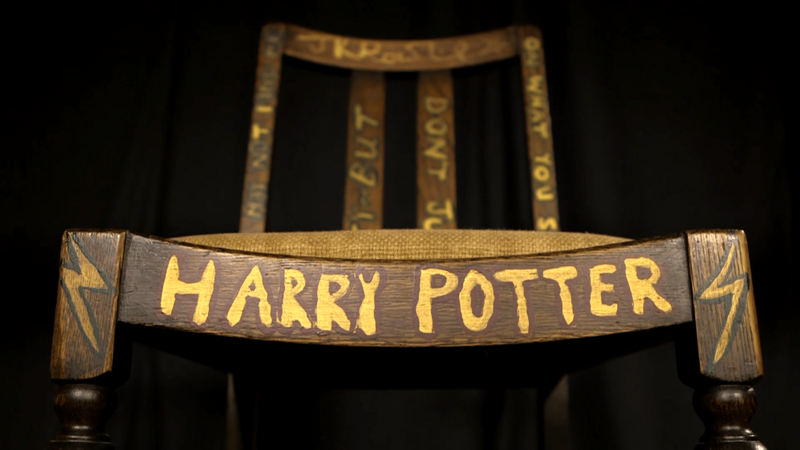 Before delivering it, Rowling painted the chair with gold, rose and green lighting bolts, as well as scrawling: “You may not find me pretty/but don’t judge/on what you see,” and “I wrote/Harry Potter/while sitting/on this chair,” along the back and sides. The minimum bid is set at $45,000, but experts believe the chair could easily sell for $100,000. Get more details in this cool video about the chair. This entry was posted in News & Reviews on March 15, 2016 by Clay Swartz. Heckuva good job. I sure apirtcpaee it.